JAXA will exhibit the Space Solar Power System (SSPS) at the JAXA Booth at the World Future Energy Summit (WFES) 2015 to be held between Jan. 20 (Wed.) and 22 (Fri.) 2015 at Abu Dhabi. What kind of system is the SSPS? The following explains the history of an SSPS study conducted both overseas and in Japan, and its merits and challenges. The SSPS was first proposed by Dr. Peter Glaser of the United States in 1968. The idea is to produce energy sources by setting up an enormous solar battery and a microwave transmission antenna, transforming solar energy into electricity first, then changing it to microwave, and sending it to a receiving antenna called a “rectifying antenna” or a “rectenna” on the ground. On the ground, the microwave is transformed to electricity to be used as an energy source. This idea was proposed to ultimately construct a society without relying on fossil fuels. Since then, various types of SSPS concepts have been suggested in the U.S. and Europe. However, due to financial and political reasons or policies, those countries, apart from Japan, have not been able to continue their research in recent years. 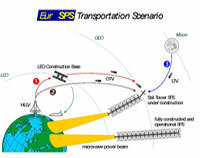 The new SSPS concept was proposed by “Fresh Look” based on technology in the 1990s. 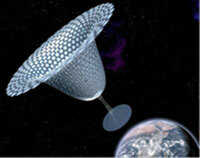 The concept studied in 2011 and 2012 financed by NASA. The European Space Agency (ESA) and German Aerospace Center (DLR) performed research in the mid 2000s. 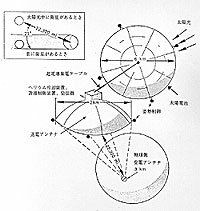 In Japan, organized research activities on the SSPS began in the 1980s, and in the 1990s, researchers of universities and national institutes led by the Institute of Space and Astronautical Science (ISAS, or the current JAXA ISAS) designed the “SPS2000” of a 10,000 kW class. In the 2000s, JAXA and the Ministry of Economy Trade and Industry (METI) studied the SSPS of a million kW class. 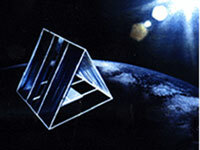 The two faces of a triangular prism are a solar battery, and the remaining face is equipped with a transmission antenna. It was supposed to be launched into a low equatorial orbit to send microwaves (=energy) to a “rectenna” set on the equator. Source: Achievement report of a commissioned task by New Energy and Industrial Technology Development Organization (NEDO) “Space Solar Power System Research” in 1993. 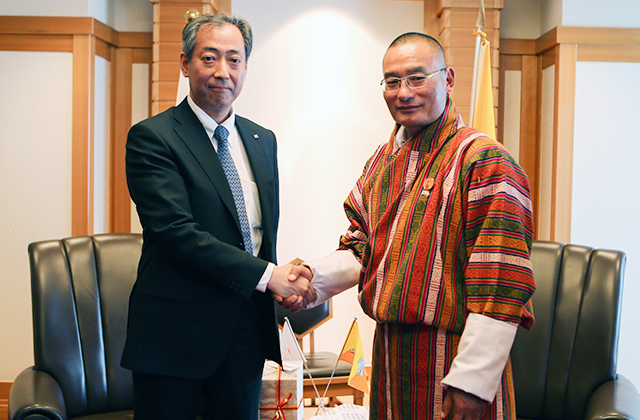 The Ministry of Economy Trade and Industry (METI) commissioned the SSPS research to the Institute for Unmanned Space Experiment (USEF, current Japan Space Systems or J-spacesystems). They adopted a panel-shaped system that integrated a solar battery for power generation and a microwave transmission antenna. The output on the ground is expected to be a million kW. 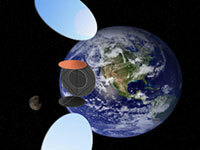 This concept led by JAXA was studied in the 2000s. 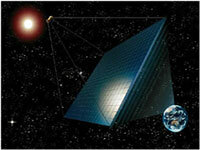 The system consists of two reflecting mirrors as a solar battery, and a microwave transmission device. The following chart shows the merits and challenges of the SSPS as follows. For achieving the abovementioned large-scale SSPSs, the funding is especially a big challenge as it requires to reduce the transportation cost of the system to space to less than a few percent of the current cost. Being a more stable energy source compared to reusable energy on the ground being less impacted by the time of day or weather conditions. Transportation technology for a massive system to space, construction technology of a large structure in space, on-orbit operation and maintenance (repair) technology for a long period are required. Highly efficient and safe power generation, transmission and reception technology is also necessary. No greenhouse gas or waste is generated. The system is less affected by natural disasters (such as an earthquake) on the ground. Consideration is required not to have microwaves/laser negatively impact human health, the atmosphere, the ionosphere, airplanes, electric appliances and other things. 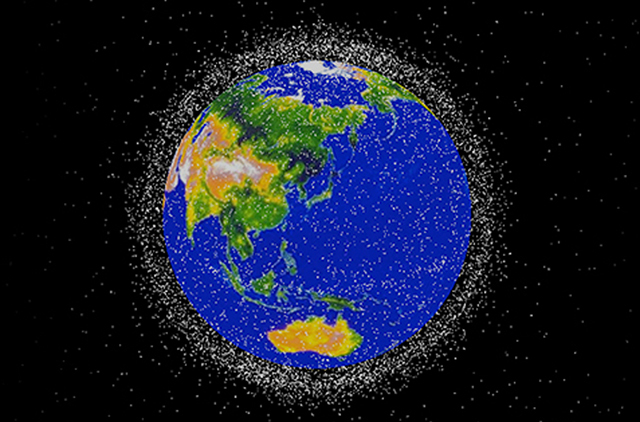 Measures must be taken for damage by space debris and solar flares. Safe disposal or reuse of the expired SSPS. No fuel cost is required for power generation. Unlike fossil fuels, price fluctuation due to regional conflicts or supply/demand relation does not matter. Cost for transportation to space, construction, operation, maintenance, and disposing must be reduced to be able to compete with other energy sources. Frequency (in the case of microwave) must be secured. In addition, the orbit position and ground reception site must be secured. 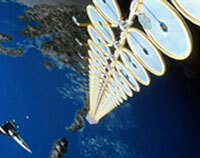 For more details about the SSPS research at JAXA, please refer to the following website. Turkey hands over samples to Japan for space environment long-term exposure experiment to be conducted under Turkey-Japan cooperation on Kibo utilization!